I know. You are probably tired of seeing all the red white & blue food posted on the blogosphere over the Fourth of July holiday. But while the colors are appropriate for that, this is really good for breakfast, and it just so happens that blueberries and raspberries are in harvest season right now. So by all means take advantage of these lovely fruits while they are here! This has gotta’ be better than a Bowl of Battle Creek. Whisk together yogurt, vanilla and honey/Splenda. 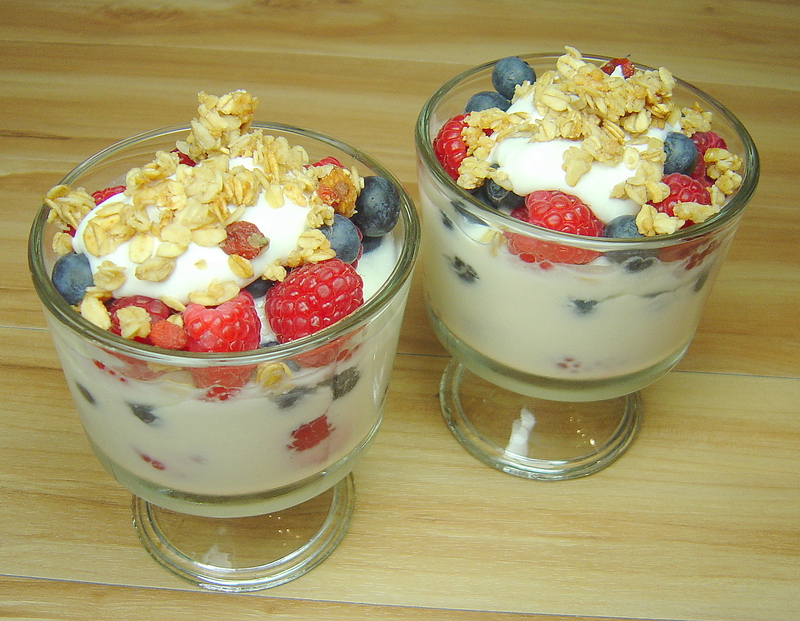 Using parfait glasses, alternate layers of yogurt, blueberries and raspberries. You can cover them at this point and refrigerate several hours or overnight, although they can be served right away. Sprinkle with granola just before serving.